Today is the final night of the Winter Olympics and that means it's time for the final event of the SKW Woolympics. Before we get to the final matchup, it's time for the medal ceremony for the last event, Fast Eating. This event wasn't even close! Steve ran away with it to win his first gold medal of these Woolympic games. Kat won the silver and Wilbur won the bronze. 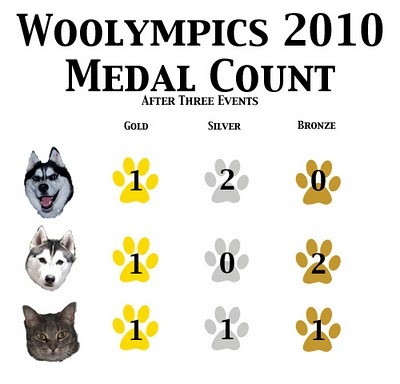 And now for the medal count. Our final event of the games is the leash walking event. Now you might think that it's totally unfair for Wilbur to complete in proper leash walking, but until recently, Steve and Kat were also incapable of properly walking on a leash. So without further ado, the leash walking event! Editor's comments: This video is longer because we wanted to leave in the post-event wrestling matches and also doesn't feature the Woolympics theme music so that we could also have a secondary event with Steve and Kat of who made the most noise while the other was competing. Voting will be open until Wednesday! Mar 2 I misunderstood, honest!